A hovercraft is a vessel that creates a cushion of air between itself and the surface beneath it, floating on top the condensed pocket of air. For this reason, a hovercraft might also be called an air-cushion vehicle or ACV. The pressurized air allows the vessel to travel over a surface without touching it, which helps hovercraft avoid friction and be extremely versatile. Who Made the First Hovercraft? Dr. Christopher Cockerell is credited with inventing the hovercraft and gained the patent on it in 1954. He started experimenting by using air to lift kitchen supplies and measuring the lift with scales. By 1958, only four years later, the British government was supporting the development of the SR-N1 craft, which was completely amphibious. When Was the First Hovercraft? Hovercraft history goes all the way back to the 1700s and even earlier. Emanuel Swedenborg dreamed up a human-powered hovercraft in 1716 but didn’t have enough technology to make his dream a reality. Over 150 years later, John Thornycroft attempted to support a boat as part of his quest to create faster vessels. He achieved mixed results and some of his vessels from as early as 1877 are preserved in the Hovercraft Museum. The industry started seeing more success by the mid 20th century. How Far can a Hovercraft Travel? Military hovercraft have been known to achieve a maximum range of over 350 miles, but that kind of technology isn’t feasible for private owners. Expect a quality recreational hovercraft to have about 150 miles of range on a single tank of gas. Does a Hovercraft Actually Hover? The short answer is yes. A hovercraft uses fans to force enough air under the vessel to lift it off of the ground, which allows it to move over any completely flat surface. A hovercraft has a skirt around its perimeter to keep the cushion of air contained, and that skirt may come into some light contact with the surface below, especially because it’s rare to find a perfectly flat surface. The principles of flight at play in a hovercraft make it more like an airplane, or especially a helicopter than a typical boat. What Does a Hovercraft do? A hovercraft can travel on air over any flat surface, which gives it a variety of uses. It’s ideal for maneuvering in shallow water and is even used for military applications like fast beach landings. As far as recreational hovercraft go, most people use them to get back and forth, take a cruise, or even race around on the water. How Fast is a Hovercraft? According to Guinness World Records, Bob Windt achieved the fastest speed in a hovercraft at the World Hovercraft Championships in 1995 with a top speed of just over 85 mph. Recreational hovercraft typically achieve top speeds of around 50 mph and cruising speeds of 30 mph. They will be faster-going downwind than they are if they have a headwind, and they are also faster when the surface is flatter. That is, your hovercraft will hit better top speeds when the water is smooth as opposed to choppy, because waves can disrupt the air cushion. 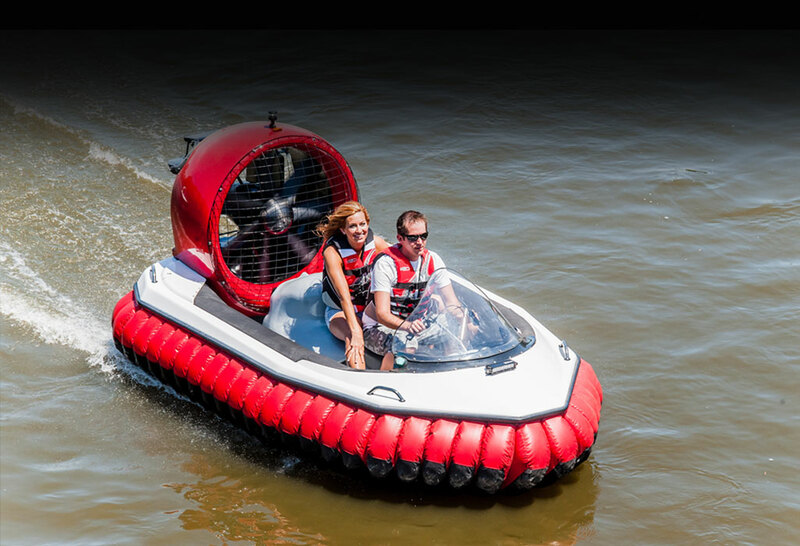 Nautical Ventures is your source for the best deals on hovercrafts in Florida. Use your hovercraft as a unique and exciting yacht tender or as its own individual craft. This is a futuristic way to get back and forth or enjoy a state of the art cruise. Your friends and onlookers will be delighted and amazed by this technology, and the captaining experience is unlike anything else. Contact us to learn more about this fascinating vessel, or visit us in person to see it for yourself!